Your Term as Commander-in-Chief Begins Today! 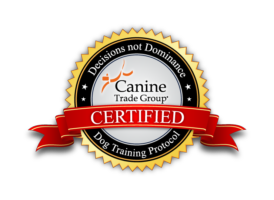 CANINE TRADE GROUP CERTIFIED DOG TRAINING IN WASHINGTON, DC AND THE SURROUNDING AREAS! We are expert Professional DC Dog Training offering reward-based, balanced dog training, and behavioral problem solving, for dogs and their families in the Washington, DC, Virginia and Maryland areas. Our training begins in your home, before progressing to a public setting such as a park, where your dog will learn to respond to your dog training commands regardless of distractions. Our goal is to make sure both you and your dog are successful and prepared for the real world. We don’t train robots we train dogs to be happy, behaviorally balanced members of the family! Our dog training regularly succeeds when other trainers have failed and we always commit to working with you until we achieve all of our training goals. If you have been told in the past that you will have to just “live with” your dog’s behavior issues, or worse, have been told that you shouldn’t keep your dog, DON’T GIVE UP! We can help – no dog is beyond help to us. We have worked with some of the worst cases of aggression and we have been able to fully rehabilitate those dogs. Our training does rely heavily on owner follow through – ultimately we are here to give you the knowledge to help your dog through his or her behavior issues. We are members of Canine Trade Group, a selective process that involves hundreds of hours of hands-on training, and study of the science of dog behavior and training. Following this, Canine Trade Group trainers must demonstrate the ability to solve complex behavior problems, as well as provide instruction and follow-up to dog owners, which is why our training methods have been referred by vets for over 26 years. Our training program works for dogs of all ages and breeds. Most of the dogs we work with have severe behavior issues such as fear aggression, dog aggression, separation anxiety, hyperactivity, etc. We customize each training program to work for the dog and owner. Our ultimate goal is to keep dogs in their home and create a happy environment for everyone in the household. There are far too many dogs surrendered and given up on just because they have behaviors problems that CAN be fixed. We are here to fix those problems and save dogs lives! Take the first step in a life-long relationship with your dog that is based on trust and mutual respect. Call DC Dog Training at 202.318.1380 or use our contact form today to schedule a no-obligation* behavior consultation today!